This time we bring you cheap Milwaukee airfares for $290 r/t, including taxes. Book right now, fly with Frontier Airlines and save at least $35 compared to any other airline! Act fast, prices are subject to change! This very flight was provided by Cheapoair but our deal hunters have found it on Travelgrove. Yet, you should also search the sites of the competitors, maybe we have missed something and there really is a better flight offer out there. Check out the screenshot about the offer and you will see that the Milwaukee flight will depart from Los Angleles International Airport (IATA code: LAX) on September 3 and will return from General Mitchell International Airport (MKE) on September 8. You will have one stop each way, both in Denver, the first one for 4 hours 36 minutes and the second for 17 hours 22 minutes. 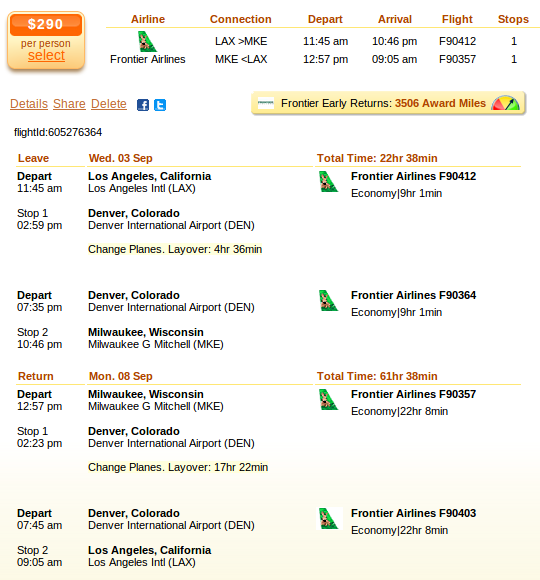 Frontier Early returns, the company’s frequent flyer program, will provide you with 3,506 award miles for purchasing this fare. This many miles will get you about 25% of a free domestic flight in the US. We have found the top 5 cheapest airlines for the Los Angeles to Milwaukee route. Frontier Airlines in the cheapest with its $290 r/t airline ticket, the next best offer is $35 more expensive operated by an undisclosed major US airline. This entry was posted on Monday, May 26th, 2014 at 5:38 am and is filed under Airfare Deals. You can follow any responses to this entry through the RSS 2.0 feed. You can leave a response, or trackback from your own site.